What Determines the Transfer Speed on My Home Network? - Ask Leo! What Determines the Transfer Speed on My Home Network? The communication path between two end points will be the slowest piece of the connection path. That will be the maximum speed that you can achieve on any network. If I have 10/100 router and a gigabit switch and gigabit computers (four of them), does the router determine the network speed? Should I switch to a gigabit router for best performance? That depends on how all of those computers are connected to one another. When it comes to network speed, look at how your devices are connected. If you’re transferring data from computer A to computer B, the maximum network speed between those two machine will be the speed of the slowest device between them. For example, you say that your computers have gigabit network interfaces. 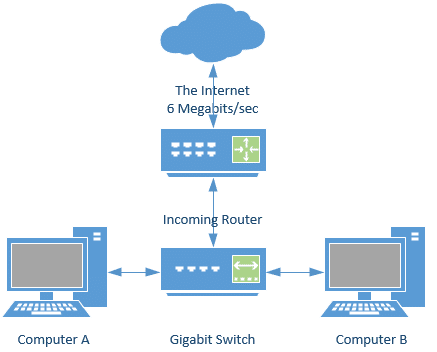 If they’re both connected to the same gigabit switch, then in theory those two computers would communicate with each other at a gigabit. In reality, speeds are actually somewhat slower for an assortment of reasons, but you’re maximizing what you can by actually going through the gigabit switch. The maximum speed that you could possibly get would be 100 megabits – the speed of the slowest device through which the data must pass. In this case it’s the 100 megabits per second capacity of the router that is that limiting factor. In reality, the practical speed is lower than that, but you’re maximizing what you can out of your 100-megabit router. If communicating between machines A and B was important, then all I would really do is connect them both to the same gigabit switch and you should be fine. In fact, I have my internet coming into a router. Even though that router may have multiple ports, I will connect only one thing from that router to a high-speed switch (like a gigabit switch) and then connect everything into the switch. While that doesn’t help my internet speed, which I’ll discuss in a moment, it allows all the machine-to-machine communication that might happen on my local network to occur as fast as the machines involved can handle. Yes, there’s still some communication that happens between the machines and the router; things like DNS and some other local operations. But the stuff that we really care about – the actual data transfer path – should happen machine to machine and should go completely through that high speed switch. There’s one last piece of this puzzle; that’s the internet itself. It doesn’t really matter what speed your equipment is when you’re connecting to the internet, as long as it’s faster than your actual internet connection speed. For example, at home I now have a 6 megabits per second download/2 megabits per second upload on my internet connection. As far as internet speeds are concerned, it doesn’t matter if I have a 10-megabit router, a 100-megabit router, or a gigabit router. Everything that goes to and from the internet is being throttled by the maximum speed of my internet connection. Machine-to-machine communications all happen at full speed across my gigabit switch. Anything that goes up and down from the internet is limited in speed by the internet connection itself. Whenever you look at network communication, ask yourself where the end points are. Look at the communication path between those two end points and then whatever is the slowest piece of that path is the maximum speed that you can achieve. 1: Note that other devices on the network diagrams are simply not shown. 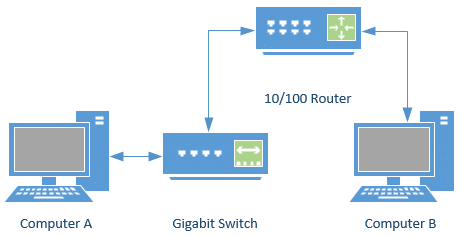 While a simple two computer setup might involve both a switch and a router for an assortment of reasons, typically this type of layout is the result of having several devices connected in a local area network. The diagram focuses on only those devices involved in the computer-to-computer communication path. « Previous post: Should I upgrade to a 64-bit operating system? I have everything plugged into my router. While I do not transfer computer-to-computer, I do use my computer to download content from my Tivo for backup plus to load onto my iPad. It makes sense when you explain it but it never occurred to me that the router was slowing down the Tivo to PC transfers (which do take a loooooog time). I’m going to have to add a high-speed switch. Any switch recommendations? It is very important to note Leo’s comment repeated above, with my addition. I believe some Routers will only actually work at the speed of the slowest connected PC. Of that is the correct, then one elderly PC could throttle all the other likely connections, even if not involved in the transfers. @Ronny: Your situation does NOT require a gigabit switch. You are doing things just fine with your single-computer situation. Tivo-to-PC transfers are notoriously slow no matter what hardware you have. @Alex: Leo’s original statement was correct as-is. Routers do just that — route traffic. Although there’s some intelligent overhead involved, a router will pass data through as fast as it can no matter where it’s coming from or where it’s going. I’ve heard the same misunderstanding before, but if that were the case, then in my office with hundreds of employees and computers, one slow PC connected to the network would slow everything down. Thankfully, not true.